Tottenham's Jermain Defoe has revealed how his Christianity helped heal his disappointment at not being part of England's World Cup squad last summer. Defoe was on stand-by but returned from Germany before the tournament began. He told Football Focus: "I've always been a religious person, and I try to think that every disappointment might just be a blessing in disguise. "I thought it was not meant to be, that I should keep positive, keep praying and hopefully my time will come." The 24-year-old striker has bounced back from the disappointment to score 10 goals for Tottenham so far this season. 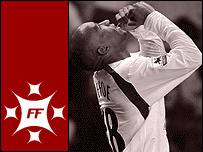 And Defoe added: "I pray every day. In the mornings and, before I go to bed. I think it's important to pray not just when things are going bad. "When things are going bad, it's easy to pray and ask God to help you out, but it's also important to pray when things are going well and show your appreciation. "I think my faith is important. Being young as well, sometimes it's difficult, but I've got a good family behind me as well." Watch Football Focus' 'Faith in football' special report on BBC ONE this Saturday at 1210 GMT.